Ha! I laughed, let me tell you it was not always that way! I was just as bad as everyone else at speaking in front of groups. The only difference, perhaps, was that I recognized long ago that public speaking wasn’t an optional skill in business. The communication skills necessary to be a good public speaker were absolutely essential – even if just to be able to pitch a single client or convince a future employee to trust you with their career! I worked at it – worked at it some more – and proactively tossed myself into situations that forced me to speak in groups, think on my feet and prepare properly. I signed up to speak at conferences, on panels, gave presentations internally to my own company and even invented a whole session at our annual ShareASale ThinkTank, called “Things We Need To Fix” where I sat in the middle of a room and answered (sometimes difficult) questions for several hours about our company. Over time, I would have to say that my strategy worked. So, when someone tells me after a presentation that they themselves wish to be as good at public speaking or as comfortable on the stage…. I tell them that there is nothing natural about having public speaking skills – you have to learn it! Being able to speak in public is an absolutely essential business skill. It is, in fact, so essential to communicating effectively that I’ve made it mandatory in all of our departments at ShareASale, a company I founded in the year 2000. Every Friday, ShareASale employees (different ones every week) identify themselves as speakers at our weekly meeting. Anyone is eligible and there are prizes available basically for anyone willing to put yourself out there. Speakers can present any topic they choose, doesn’t matter whether it is related to their job or not! We’ve had presentations on comedy, “cutting the cord” for cable television, home automation and yes, even some that related to Affiliate Marketing – our core business. I’ve been able to see the growth in both comfort, preparation and overall performance which has translated into greater success for our business. After all, how can I expect an employee to deliver a quality and compelling presentation to an actual client, if they aren’t able to do so with and among friends at the office! While we don’t actively grade presentations, they are a natural way for any ShareASale employee to show off their skills, prove that they are ready for the next step in their career or just prove that they should be at the next client pitch. These used to be commonplace in the lives of most ShareASale’rs, especially those on the younger spectrum who recently graduated, whose lives used to revolve around semesters, projects and finals. Through these end-of-the-year projects, we bring back a lot of that camaraderie and attention to deadlines, mixed with presentation skills every year. These presentations are much more in-depth than our weekly presentations and offer a real chance to look at how an employee prepares, practices and presents. On August 3rd, 2015, Brian Littleton, Founder and CEO of ShareASale, delivered the Keynote to a packed house at Affiliate Summit East 2015. Watch the full video and learn from Brian’s personal stories, business justifications and best practices. A tracking gap has always had a beginning, usually “30 or 60 days ago”, but now it will have an end … and possibly another beginning again! Merchants just got a whole lot more flexibility in how they can commission different affiliates, and different segments of Affiliates. ShareASale Fall Catalog 2015 Released! 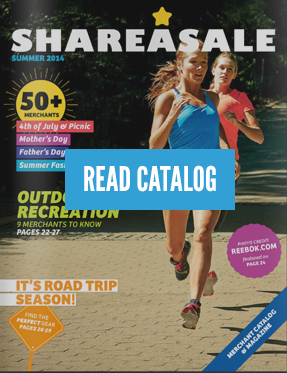 Each quarter ShareASale releases a new Merchant Catalog & Magazine featuring Merchants with relevant products for the upcoming season, as well as, noteworthy articles. We are happy to announce the release of the 2015 ShareASale Fall Catalog!